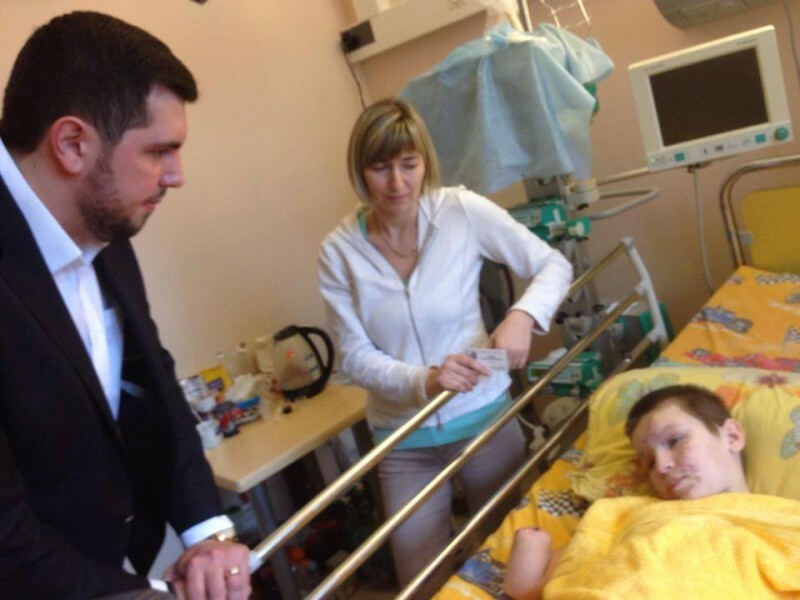 Visit to child victims of Ukrainian army bombs | Fight Back! Moscow - Vanya is a determined boy of nine. He has a competitive streak, especially for races and bike riding. Because of the war being waged on the people in the Eastern Ukraine region called Donbass, he’s become a celebrity. That’s because he survived shells fired by the Ukrainian army that hit his home, although he lost his legs, one of his arms, and his eyesight. His five-year-old brother, Artem, didn’t survive the blast. Our delegation from the U.S. went today to the Research Institute for Children’s Emergency Surgery and Traumatology. Dr. Alexander Bryantsev led us to visit with five of the seven children currently under their care. We next visited Okhsana, a 14-year-old girl. She had her school books, but she was more interested in the beading work she was doing with wires, constructing small, delicate looking flowers. She had a metal frame over her pelvic area, holding together her bones which had been broken when a shell struck her at her home in Makeevka, a suburb of Donetsk, in January. Okhsana was able to smile a little when we came in to her hospital room. Dr. Bryantsev explained she has a broken femoral neck, the part of the bone just below the ball in the hip joint, and that hers is a difficult injury to heal. If the bones knit back together, she will walk again. If not, she’ll need a brace for the rest of her life. Next we met Alexander, a 16-year-old who had lost his eye from the shell that struck his home. While his injury was sustained eight months ago, he is waiting for the operation to install a prosthetic eye next week. He was injured because he covered the body of his two-year-old sister when the shells started falling. She survived. His mother, Galena, told us, “I’m a mother. I don’t want war. But if America wants war, have it on your own land.” She also said how grateful she was to Russia for the medical care provided to her son. Misha is eight. He has a hole in his forehead and is awaiting surgery. His four-year-old brother died when the bombs hit his home. His mother lost her leg. Alexandra is seven, Maxsim is 14. Both have head injuries that will require titanium plates. Alexandra’s operation will be the next day, Maxsim a week later. These are only a few of the casualties of the U.S./NATO backed war waged by the Ukrainian Army and national guard against the people of their own country.